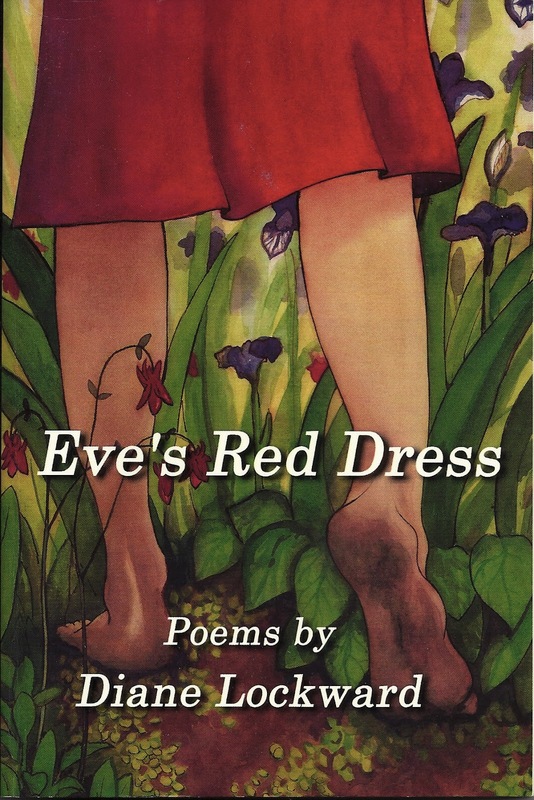 I've had two more poems reprinted from my first book, Eve's Red Dress. "Feeding Habits" and "Losing the Blues" both appear online at Redux, a site run by writer Leslie Pietrzyk. This site is "invitation only," though there is a time when you can submit poems. Then if the poems pass Leslie's approval, you receive an invitation. Right now the submission window is closed. The policy is that the poems must first have appeared in print but not be available elsewhere online. The site features both prose and poetry. The online posts occur each Monday. Then on Tuesday the weekly post goes out to email subscribers. You can subscribe at the site. I was also asked to send "The Story Behind the Poems," so that follows the two poems. My story begins, "We poets are multi-taskers. We are never just dining or driving; we are also gathering material for poems." Read more. Lest you think that I'm only repeating myself these days, I'm also happy to report that I have two spanking new poems, "Your Blue Shirt" and "The Wrong Monkey," in the fall issue of Innisfree Poetry Journal. 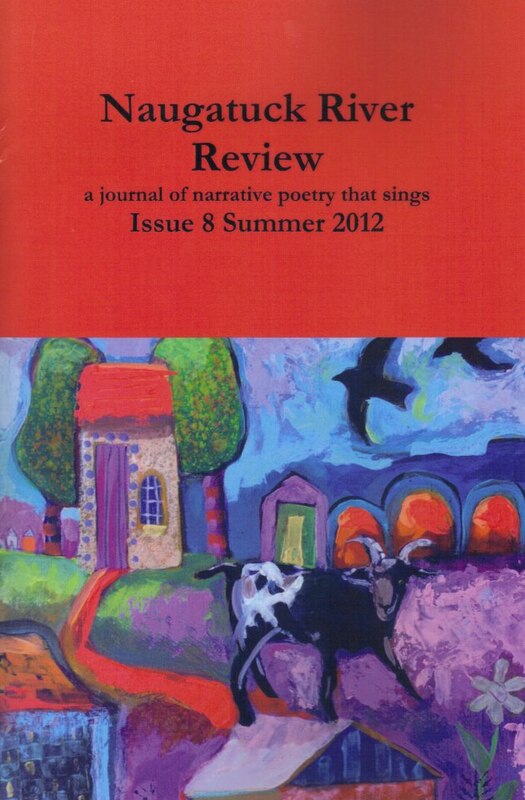 This issue is loaded with a terrific variety of poems and a number of book reviews. You'll find poems by at least four dozen poets, including Kim Bridgford, Grace Cavalieri, and Rosemary Winslow. I've also just received my contributor's copy of Naugatuck River Review. How gorgeous is that cover? Publisher Lori Desrosiers has made a beautiful reality of her dream of having a print journal devoted to narrative poetry. My poem, "Warnings," is joined by poems by Pat Fargnoli, Michelle Bitting, Paul Scot August, and many others. The journal is currently accepting online submissions for their annual contest which offers a $1000 prize. If interested, you'd better move fast as the deadline is September 1. You can order a copy of the new issue at the website—and should do so! One last thing—my poem, "Your Blue Shirt," was written to one of the prompts I created for my monthly Poetry Newsletter. Not yet subscribed? Head on over to the sidebar and sign up in time for the September 1 issue. I used to believe what I thought was a metaphor about writing poetry: that it's addictive, like a drug. But I understand now that composing verse is actually, not metaphorically, addictive: there really is a kind of rush, to use the addicts' term, when you're generating or revising a poem. Busy the mind is, scurrying this way and that, spinning and soaring, and, as is apparently the case with stimulants, there's an altered experience of time and of the self as it moves through time—I'm sure other poets know what I mean by this. And they must know, too, that when one isn't working on a poem, doesn't have any poetry work to do, there are real withdrawal symptoms. In my case, I fall into something like depression, and as in other depressions, I begin to doubt, to ask questions I shouldn't, about my work, my life—all I grumbled about just now. Goethe put it succinctly: "The poet's requisite trance is the most fragile element in his armory." I think that I kept returning to this paragraph because I do indeed know what Williams means when he says that writing is more than a metaphorical addiction. I've felt the rush he mentions, the one that occurs during generating or revising, when the work is going well, when I'm onto something. This rush does not happen on those days when the work won't work for me, when nothing comes or only garbage comes or when I'm stalled thinking about something that's bugging me. But when that rush comes, it's wonderful. And it lasts all day. I feel more than happy—I feel exhilarated for the rest of the day. I seem to be on hyper-alert. I pay better attention to what people are saying. My word radar is on. But I also daydream more. The poem buzzes in my head. I'm working on lines, images, figures. When I wake up during the night or can't sleep, the poem is there like a sweet dream. The depression that Williams mentions, that down feeling that comes when we can't work, when we go through one of those awful periods when we fear we're all washed up, that we've got nothing left to say, yes, I've felt that too, though I'm pretty good at talking myself out of it. I know that it won't last and that I need to get into poetry circuitously by going to a reading, by digging into someone else's poetry, by listening to poetry tapes, by allowing myself to write poorly. Eventually, something clicks and I'm back in love again. Poetry is a curative drug. On any given day when I'm feeling less than good, maybe bummed out by a headache or fatigue or a cranky stomach, if I can drag myself to my writing table and get some writing started, something physical happens. Once I get into the writing, I forget about my woes. I get over the ailment. I feel better! But show up at the table I must. This thought reminds me of what sportswriter Red Smith said, "There's nothing to writing. 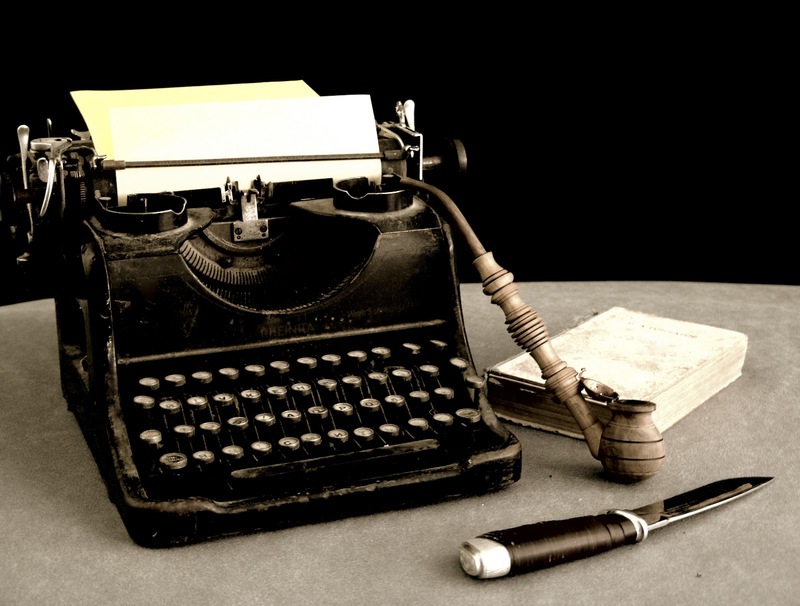 All you do is sit down at a typewriter and open up a vein." See that typewriter up above? There's the knife to open the vein. A metaphorical blood-letting can also be curative. First, show up at the desk. From time to time an opportunity to get more mileage out of a poem appears. If it seems like an attractive opportunity, I'll pursue it. For example, I'm really fond of having my poems appear in an anthology. I'm usually less enthusiastic about submitting to one that doesn't yet have a publisher as all too often the editor never finds a publisher. But if I know the editor's name, usually another poet, I'll go ahead. Thus it is that my sestina, "Why I Read True Crime Books," was recently accepted by Marilyn Krysl and Carolyn Beard Whitlow for a collection of sestinas called Obsession: Sestinas in the 21st Century. The collection will have an introduction from Lewis Turco. Fingers crossed that they find a publisher. I've also recently come across two online publications that publish only previously published poems. So I submitted and am happy to say that each of these took one poem, both of which appeared this week. "Eve Argues Against Perfection" appears in Reprint Poetry. This publication features one poem at a time, along with a brief bio and the author's selection of one thing from the past she'd like to revive. Mine was a marshmallow sundae with black raspberry ice cream and chocolate sprinkles. They accept a maximum of 3 poems in a submission. Response time was remarkable: within an hour! The other poem, "Pastiche for a Daughter's Absence," was taken by Re/Verse. This site posts just the poem, also one at a time. And you are allowed to submit only one poem at a time. Again, the response time was very nice: 3 days and then the poem was posted the next day. Instant gratification is cool. Getting more mileage out of a poem is cool. The internet offers us the opportunity to extend our publications beyond the first or only place where they appeared. Both sites maintain Archives. Also cool. Both are from my first book, Eve's Red Dress, which was published in 2003. "Eve Argues Against Perfection" first appeared in print in US 1 Worksheets, a NJ journal. "Pastiche for a Daughter's Absence" never appeared in a journal as I wrote it shortly before the book came out. So I'm happy to get this new exposure for both poems. I recently wrote about a new self-publication venture, She Writes Press, which evolved out of She Writes, a social network for women authors. Their price struck me as steep, and I'm not a fan of self-publication. But for those of you who plan to go that route, it's important that you be well-informed about your options. My sense about She Writes Press, which considers itself a hybrid, is that you will be dealing with people of integrity and will receive a quality product. How many poets, though, could justify an outlay of $3900? I recently came across another new publication venture, World Enough Writers, a cooperative press for poets and fiction writers. 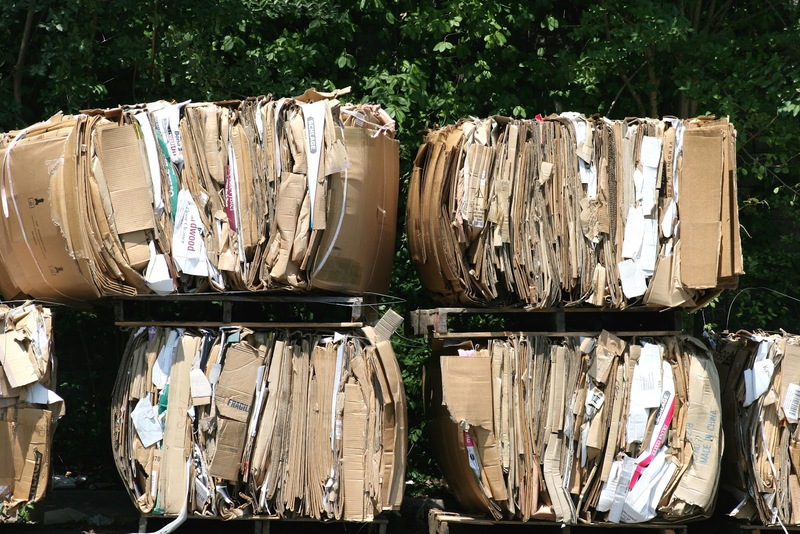 What's the difference between a cooperative press and a self-publication press? Both require a monetary investment, but a cooperative also asks for an investment of your time and talent in helping the press to produce your book. It also expects that you will thereafter participate as a member of the cooperative. A typical self-publication press accepts any manuscript submitted as long as the check clears. With a cooperative, there is selectivity and editorial oversight. Only a limited number of books will be published per year. Since anyone could set up shop as a cooperative, you need to be sure that the founders and members know what they're doing and have high standards. Typically, the publishers are themselves writers who initially banded together to publish their own books. Alice James began this way as did Marsh Hawk Press, both of which now have sizable catalogs and reputable authors. Both also run contests with submission fees and both do some advertising. World Enough Writers appears to be following in their footsteps and starting out small. The founder of this press is Lana Hechtman Ayers, an accomplished poet with several books to her credit and a good deal of publishing experience. She is also the publisher behind Concrete Wolf Press, which has been publishing poetry chapbooks since 2001, and the publisher behind MoonPath Press, which publishes books by poets living in Northwest Pacific states. 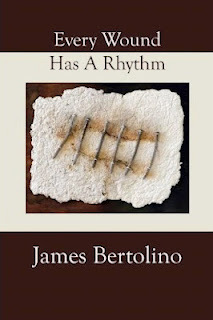 So far, World Enough Writers has published just one title, Every Wound Has a Rhythm, by James Bertolino. If you visit the Amazon page, you can use the Search Inside feature to see publication credits and to sample some poems. I'm including the cover which has attractive artwork. Submissions are read all year. You pay a $10 reading fee for 10 pages. These pages are then read by two members of the cooperative. If they like what they've received, they request the rest of the manuscript. Upon acceptance, the author is required to send a $100 fee for membership to the cooperative and $550 for the publication costs. The book is sold through Amazon but the author does not receive royalty payments for books sold there. The author is given a deep discount for copies from the press but should be prepared to do readings and promote his or her own book. It's too early to say how either of these presses will thrive, but I suspect that World Enough Writers is better suited to poets; it's certainly more affordable. Below is the video I recently made using photos from this year's Poetry Festival: A Celebration of Literary Journals, an event that took place on May 20. This was the 9th year I've run the festival. Each year I invite the editors of 12 journals to participate. Each journal gets half a table where the editor displays the most recent issue along with submission and subscription information. This part of the festival takes place in the Reference area. I also ask each editor to invite two poets who have appeared in the journal. So we end up with 24 poets, each of whom reads two poems. The readings take place in a separate area, the Community Room, which seats approximately 80 people and remains close to full throughout the readings. The readings are divided into 4 sessions, each including 3 journals and 6 poets. In between readings there's a 20-minute break which gives visitors time to browse the journals and chat with the editors. Poets are invited to bring copies of one book to offer for sale in the book sale area at the front of the library, so visitors also use the break time to browse and buy those books and get them signed. This event draws 200-250 people. Some come for part of the day. Others remain for the entire 4 hours. People meet for lunch before the Festival. People go out for dinner after the Festival. It really is a very festive event, a day filled with poems, poetry chatter, journals, and books. This event takes place at the West Caldwell Public Library in West Caldwell, NJ, and is assisted by librarian, Ethan Galvin. He arranges for the Friends of the Library to provide volunteers to man the book sale table. He also runs off the program which is given to each visitor. And he sends out press releases. The local Shop-Rite donates cookies. Needless to say, the assistance Ethan and the volunteers provide is invaluable and deeply appreciated. If you're nearby, plan to join us for next year's 10th anniversary Festival. In the meantime, please enjoy the movie.